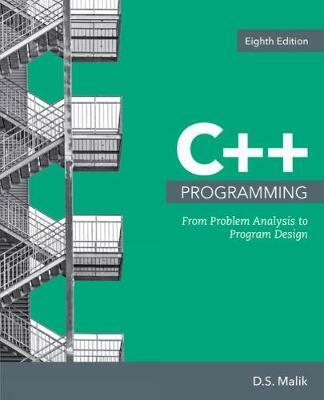 Learn how to program with C++ using today's definitive choice for your first programming language experience -- C++ PROGRAMMING: FROM PROBLEM ANALYSIS TO PROGRAM DESIGN, 8E. D.S. Malik's time-tested, student-centered methodology incorporates a strong focus on problem-solving with full-code examples that vividly demonstrate the hows and whys of applying programming concepts and utilizing C++ to work through a problem. Thoroughly updated end-of-chapter exercises, more than 20 extensive new programming exercises, and numerous new examples drawn from Dr. Malik's experience further strengthen your understanding of problem solving and program design in this new edition. You review the important features of C++ 14 Standard with timely discussions that ensure this edition equips you to succeed in your CS1 course and beyond.